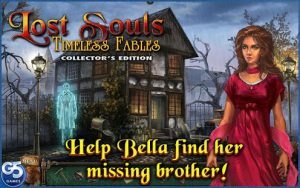 Lost Souls 2 Timeless Fables : Plunge into this awe-inspiring sequel to the breathtaking adventure Lost Souls: Enchanted Paintings! Note This game supports high-end smartphones and tablets such as Nexus 7 and Nexus 10. G5 Games – New game apps every week! Love it Brilliant game. Great length. Beautiful artwork. Ppl complaining about the cost need to take notice of how long the game takes to play. Well done guys! Is this game supposed to be so easy? Just not my cup of tea. Too easy, too easy and far less sinister then what Im used too.